Sundargarh. The land here is different. Those born on its soil are infused with love for hockey. As toddlers grow into adolescents, they eat, sleep and breathe the game. Hockey soon becomes their identity, transcending the boundary of gender. The land that gave India legends like Dilip Tirkey has produced gems like Jyoti Sunita Kullu. Matching steps with the boys are the girls of Sundargarh who have won laurels for India in equal measures. In 2016, when the Indian women’s team created history by qualifying for Rio Olympics after a gap of 36 years, half the squad was occupied by players from Odisha. India had found a place on basis of its fifth-place finish in women’s Hockey World League Semifinals and five Odisha players — Deep Grace Ekka, Lilima Minz, Namita Toppo, Sunita Lakra and Anupa Barla — were the part of the team that represented the country at Rio Olympics. Like Sundargarh boys, the girls have shown keen interest in hockey. 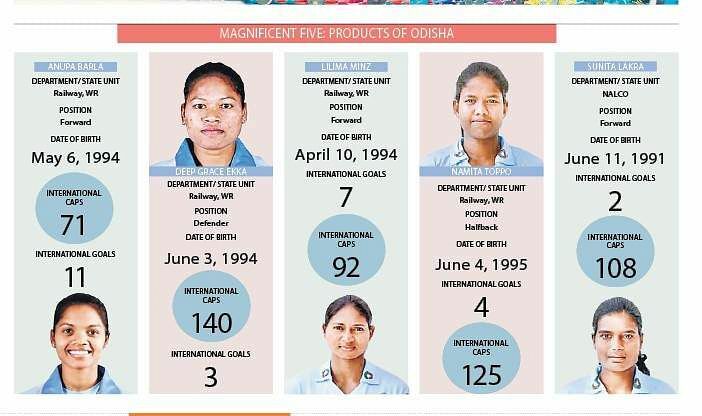 Like Dilip, Lazarus, Prabodh and Ignace who were integral part of Indian senior teams between 2003 and 2005, currently, five Odisha women are permanent fixtures of the women’s team. Such has been the state’s influence on the game. Deep Grace is a product of the Sundargarh SAI Centre, while Lilima, Namita, Anupa and Sunita are part of Panposh Sports Hostel, Rourkela. The rise of Odia women is not meteoric. Rather, it has been a story of perseverance of the individuals and a support system put in place by the Odisha government. When the government set up the Panposh Sports Hostel for men in 1985, it laid the foundation stone for Odisha’s glorious journey in the game. Soon the need to provide an equal platform for women was felt and the government added them in the sports hostel in 1987. In just seven years, Odisha produced its first international woman hockey star, Gloria Dung Dung, in 1994. “The women players marched ahead after the inclusion of turf in the sports hostel in Rourkela and Sundargarh. Though the girls used to get only a few hours to practise on the turf as both boys and girls shared the same ground, they persevered,” said coach Lucela Ekka under whose tutelage Deep Grace grew from strength to strength. A senior coach at Bhubaneswar Sports Hostel now, Lucela spent years at Sundargarh nurturing talent from the region. While time was initially a constraint for practice and training, once floodlights were installed, that problem was taken care of. “After that the state’s representation in the national circuit increased manifold. Our tribal girls put their best efforts with dedication and discipline to bring laurels for Odisha as well as for India,” says Lucela. There is an interesting story around Jyoti Sunita Kullu, An Arjuna award winner, who has been an inspiration for the junior players of the state, she followed her passion. “She was, initially, selected as a middle distance sprinter but Jyoti had a different dream and she convinced her coach that she wanted to be a hockey player. Her persuasion saw that she was included in hockey stream,” says coach Amulya Behera, who was posted at the Panposh hostel between 1993 and 1997. Jyoti became the first tribal girl from the state to captain the senior national team. “In tribal communities, parents believe in gender equality. They give priority to the girl child. At the age of five, kids start playing hockey under the guidance of Physical Education Teachers or by some senior players with an aim to get admission in the sports hostels. Parents also motivate them to play hockey as it promises a better livelihood,” said Behera who is now back in Rourkela after a stint at Cuttack and Deogarh. Talent scouting is always a tough job for the coaches because of huge turnouts in Sundargarh. More than 3000 to 4000 kids take part in scouting camps. “Once they enter the hostels at the age of 12, they start playing under the supervision of professional coaches. All these kids come to the hostel with the basic knowledge of hockey,” Behera explains the progress. This process has produced internationals like Subhadra Pradhan, Banita Toppo, Banita Xess, Sarita Lakra, Mukta Prabha Barla in the senior segment, while a number of players are in the junior levels too. The secret of this success has been the huge boost to infrastructure.Players for the future: Marian Kujur, Jiban Kesori Toppo, Filicia Tappo, Ajmina Ekka, Jyoti Chhatri, Anjana Beck, Sonia Tapno and Sunita Khaka.